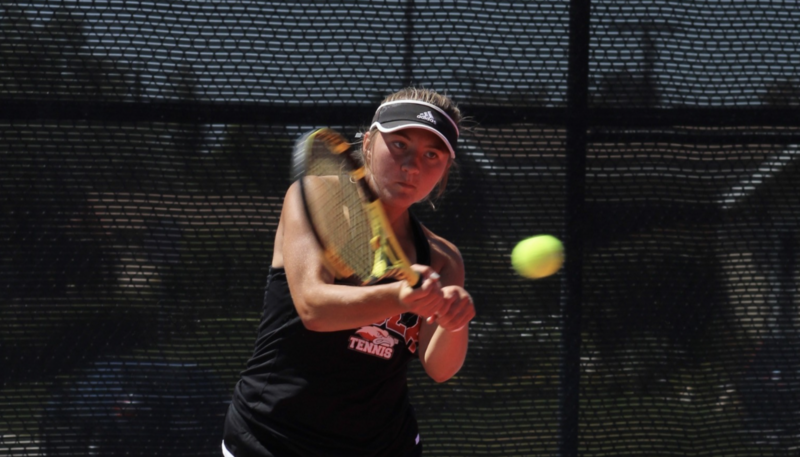 Biola comes back from doubles loss to put away Arizona Christian 4-0 in singles. Women’s tennis was back on the court at the Biola Tennis Center against longtime Golden State Athletic Conference foe Arizona Christian University for the team’s last regular season match. The Eagles looked to take down the Firestorm after having a 1-10 all-time record against ACU. The women did just that as they defeated Arizona Christian for the first time since 2013 by a score of 5-2. In doubles, junior Allison Torres and freshman Ines Diaz were first to finish, handling their opponent with a 6-2 set victory at the No. 3 position. However, No. 1 and No. 2 doubles were not able to do the same for the Eagles, as they both dropped their super set by a score of 2-6. Biola was down 0-1 going into singles play, needing to win four of the six matches to defeat ACU. The women responded as they all swept the first set of singles. Junior Lauren Lee was the first Eagle to lock in the victory in the first set, winning 6-0 against ACU’s Gabby Gutierrez. Sophomore Lily Waterhouse was not far behind her as she also finished her first set in a swift 6-0 win. Junior Tinisee Kandakai put up a long, hard battle against ACU’s Jayci Kelley. Kandakai was down throughout most of the first set, but forced Kelley into a deuce where Kandakai broke the tie to become the last Eagle to win in her first set against the Firestorm. Things were looking good for the Eagles as they all came into the second set of singles with a win under their belts. Lauren Lee and Waterhouse went in for the clean sweep as they both shutout their opponents with 6-0 victories in the second set. These victories put Biola up 2-1 on the day, needing to just clinch two more wins. Sophomore Esther Lee was the third Eagle to clinch the victory in her match when she defeated Elizabeth Kelley 6-1 in the second set. With Diaz and Kandakai both down in their second sets, it was all up to Torres to finish off ACU. At the No. 6 spot, Torres sat at 4-6 on the season, but the Upland, California native remained confident as she looked to secure the win for Biola. Torres won the match for herself and Biola with a 6-3 victory over Rachel Anklam. With this victory, the Eagles improve their record to 9-10 as they move into championship play. They will finish their season in Surprise, Arizona at the PacWest Conference Championship beginning on Wednesday, April 17.